Two consecutive photos of the 7/8 December display contain reflected Lowitz arcs. The large image above is a stack of these two photos, the small upper image being heavily unsharp masked version of it. Reflected Lowitz arc is marked with an arrow in the small image. The moment of reflected Lowitz arcs was short lasting: two photos showing them were taken within 35 seconds. Photos taken immediately before or after do not contain them. The lower small photo is timed one minute before their appearance, the halo composition being otherwise similar except for the reflected Lowitz arcs. In these photos present is also upper sunvex Parry arc, which was missing from the display phase shown in my previous postings. The reflected Lowitz arcs are remarkably long. Amazing. I've started counting how many different halo forms the 7/8 December display showed, but it seems there's always something new to come. The opposite side looks strangely distorted...? To my eyes at least. Maybe the 8mm lens is causing some effect there. There is the support wire shadow cutting the diffuse arcs on the right side, did you mean that? Another source of distortion is - as I see it - that the the camera is not pointed exactly at zenith. That's why the anthelic point is not exactly opposite to the lamp and subanthelic arc (for one thing) looks a bit "curved". Right Jari, these pretty extensive reflected Lowitz arcs here. An ice crystal sample from that 35 seconds would have been interesting - of course with comparision to a stage with no reflected Lowitz arcs. OK, Marko, now I get it. After a quick look I did not realize that there really is the shadow of the blocker support going through the image. The not-exactly-at-zenith-distortion I could see right away but somehow missed the reason for the anthelic arc distortion. That shadow is not the most obvious at quick glance. There is suprising variation in the visibility of that shadow in different photos. In some it seems not be present. Possibly the cleaner the swarm, the less of the shadow. One more thing. Forgot to specify that the shadow is halogen support wire shadow (or whatever they are called). Not from blocker. 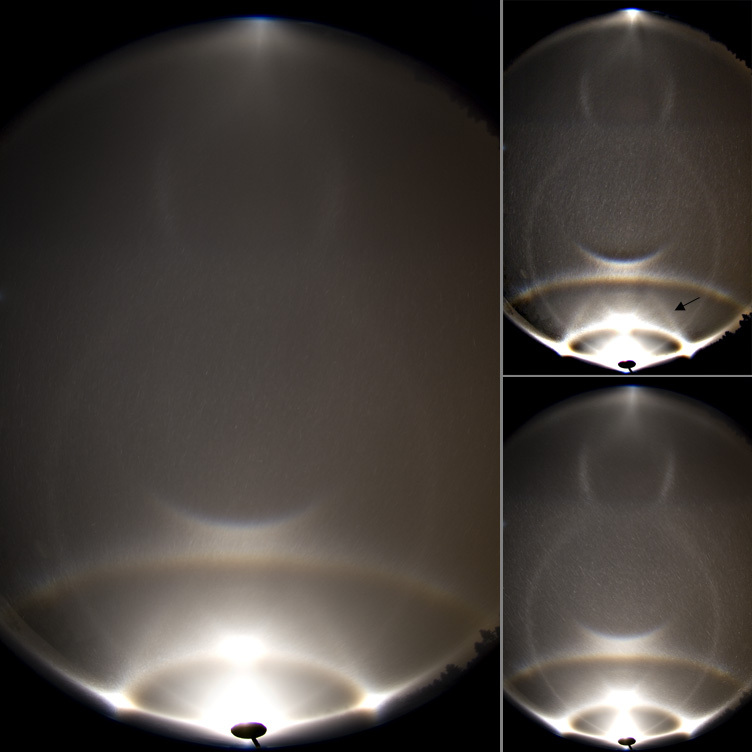 The reflected lowitz arcs are real long and they seem to loop up towards the 46d halo. I also can see clear tapes arcs as well. During the plate stage of the display did you see the regular Kern arc along the with the sub-Kern arc? Seeing both at once would be quite cool. Michael, Kern was captured poorly on two photos that were taken about 10-7 minutes before the sub-Kern photos. However, I did not see it visually, unlike the sub-Kern. It would be hard to see both Kern and sub-Kern at the same time, because either one (depending on whether the lamp is below or above the horizon) is right down at your feet where there is not much air volume for crystals and snow reflecting the lamp light gives poor contrast. Switching the places of camera and lamp takes always time. For me it took 4 minutes 13 seconds in this display to switch for subhorizon photography. In this fast changing display it is too long to allow trustworthy correlations with uphorizon photos. Anyway, not that you brought this up, guess I must put online next the Kern arc.